We all have our own body insecurities. It’s inevitable to go through life without being self-conscious about something in your life. It’s how you deal with these insecurities that determine how you’ll move forward in life. 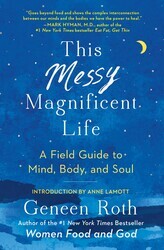 Geneen Roth, author of THIS MESSY MAGNIFICENT LIFE, shares how you should discover your body confidence. Stop trying to be the self you imagine you would be if you were smarter, prettier, thinner, kinder, more accomplished than you are. You’ve already done that. If it didn’t work the first thousand times, it’s not going to work now. Or ever. So you’re still struggling with food and your weight. So you’re still crazy in the middle of the night . . . and sometimes in broad daylight. So is ninety-nine percent of the population. I’m not saying to act on these feelings. I’m not advocating indulgence or collapse or despair. I’m saying it’s time to stand in your own two shoes. It’s time to be your own authority. You’ve given yourself away to programs, methods, big daddies for too long. Come back. As Glinda said to Dorothy: you’ve always had the power. If you’re feeling selfish, don’t push it away. Don’t pretend you’re nicer than you feel. Turn toward the selfishness, not away from it. Let yourself feel like the most selfish person in the universe—without acting on it. Notice how it changes when you let it be there, feel it, accept it. And begin to pay attention to the noticer instead of what is noticed. If you’re eating past fullness, stop. And if you don’t stop, fine—but ask yourself what’s going on. Notice what you feel, what arises inside you. Accept responsibility for your actions. You’re not a child. You don’t need to be regulated by an external authority, most particularly a diet. If you don’t love your work, if you feel like a failure, if you’re struggling to pay your bills, if you feel unlovable or worthless or crazy in the middle of the night, take a breath. Then take another. If you have cancer, if you are dying, pay attention. Listen. Look. Breathe. You’ve got a body and that body responds to what you put into it. Listen to it. If sugar makes you feel depressed, stop eating it, even if it’s on your eating plan. And rather than focus on how deprived you feel, ask yourself who it is that feels deprived. She’s probably five or eight or twelve. Are you? Climb out of your mind and back into your body, even if it feels uncomfortable. Turn toward the feeling not away from it. Treat yourself the way you would treat a small child who is lost—because that part of you is. 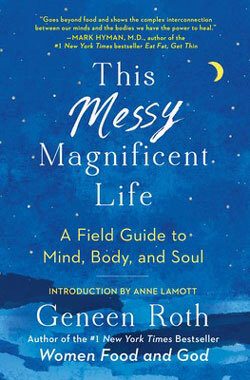 Find out how to build your body confidence in THIS MESSY MAGNIFICENT LIFE by Geneen Roth! Excerpted from This Messy Magnificent Life by Geneen Roth. Copyright © 2018 by the author. Used by permission of the publisher. All rights reserved. Photo by Gokil on Unsplash. With an introduction by Anne Lamott, This Messy Magnificent Life is a personal and exhilarating read on freeing ourselves from daily anxiety, lack, and discontent. It’s a deep dive into what lies behind our self-criticism, whether it is about the size of our thighs, the expression of our thoughts, or the shape of our ambitions. And it’s about stopping the search to fix ourselves by realizing that on the other side of the “Me Project” is spaciousness, peace, and the capacity to reclaim one’s power and joy. This Messy Magnificent Life explores the personal beliefs, hidden traumas, and social pressures that shape not just women’s feelings about their bodies but also their confidence, choices, and relationships. After years of teaching retreats and workshops on weight, money, and other obsessions, Roth realized that there was a connection that held her students captive in their unhappiness. With laugh-out-loud humor, compassion, and dead-on insight she reveals the paradoxes in our beliefs and shows how to move beyond our past to build lives that reflect our singularity and inherent power. This Messy Magnificent Life is a brilliant, bravura meditation on who we take ourselves to be, what enough means in our gotta-get-more culture, and being at home in our minds and bodies.